Crosby Group provided full structural engineering design services for a new four-story, 90,000 square foot structural steel Crime Laboratory for the District Attorney’s Office. 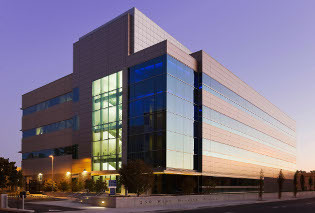 This state-of-the-art facility provides the full complement of functions required in modern crime laboratories including a DNA analysis unit, a computer forensics lab, a ballistics lab including a concrete enclosed firing range, crime scene processing, vehicle exam bays, administrative offices, office support functions, secure evidence storage and training classrooms all included in a secure facility. Due to the critical nature of the work done at this facility, buckling restrained braced frames (BRBF’s) were employed to resist lateral loads and provide enhanced performance during a seismic event. Additionally, a dual lateral system including moment frames was provided to reduce the residual drifts, and thus minimize repair costs, following a significant seismic event. Additional design components include a concrete mat foundation utilized to address expansive soils and potential liquefaction, and a three-story atrium lobby enclosed with a tube steel grid following Architectural Exposed Structural Steel (AESS) standards.